The Homefront United Network editing team was recently hosted by Extended Stay America, during the 2017 Presidential Inauguration. Invited as a media guest, we had the wonderful opportunity to travel in style, as well as feel like we never left home. Extended Stay America is the operator of an economy, extended-stay hotel chain consisting of 629 properties in the United States and Canada. Also… If you’re in the government or military and need lodging for a longer period of time due to relocation, reassignment, or BRAC, our extended stay suites are the answer. Hundreds of our hotels offer both government TDY and PCS rates and give you the advantages of a studio apartment with none of the hassles. All hotels are registered with CCR as a U.S. government contractor and are FEMA-approved. Everything you need for comfort and convenience is right there: fully equipped kitchens, on-site laundry, weekly housekeeping, flat-screen TV with premium channels, free WI-FI Internet, and free grab-and-go breakfasts every morning. Spacious suites beat renting: No lease or security deposit is required for any length of stay and all utilities are included. Hundreds of hotel rates are available at or below per diem, with nightly, weekly, and monthly rates. More on ESA’s military discounts and rates here. Because we had such an amazing trip – we thought we would highlight a bit on our stay. Our home for the week: Extended Stay America, Washington D.C. – Alexandria – Eisenhower Ave.
We travel frequently, and have stayed in so many different hotels. We actually have some really funny (and terrifying) stories, but that’s for another post. Where you stay is much more than just a room with a bed and a shower. As writers, as well as attending an event as busy as the Presidential Inauguration, we needed to feel like we had a place to feel comfortable and at peace. As soon as we entered the hotel, we were greeted with smiling faces and an inviting warm lobby. The lobby was spacious with sufficient seating. I really liked that it felt cozy and warm – very similar to walking into your own or a friend’s home. We could sit an relax with a complimentary cup of coffee. We were both welcomed by their management staff, who you could tell went above and beyond for every guest. Never staying in an ESA before, we were quite pleased with the layout of the room. As soon as we entered our room, we didn’t have the sense of it being a “hotel” but more like a small apartment. We had a living area, along with our own working area – which is great for writers! We also had a cozy dining area with a fully equipped kitchen. Greeted by a welcome basket with lots of swag, who doesn’t love swag?! I thought this was a very nice and personal gesture from the management team. Our bedroom was simple – yet cozy and tranquil. Two women traveling, and yet we had plenty of space to unpack and not feel cramped. My favorite part of the stay? The bathroom. Other than it being one of the most cleanest bathrooms I have ever seen, it was modern and provided any toiletries we needed. There was also plenty of counter space and organization for make-up (which is needed for 2 ladies traveling). 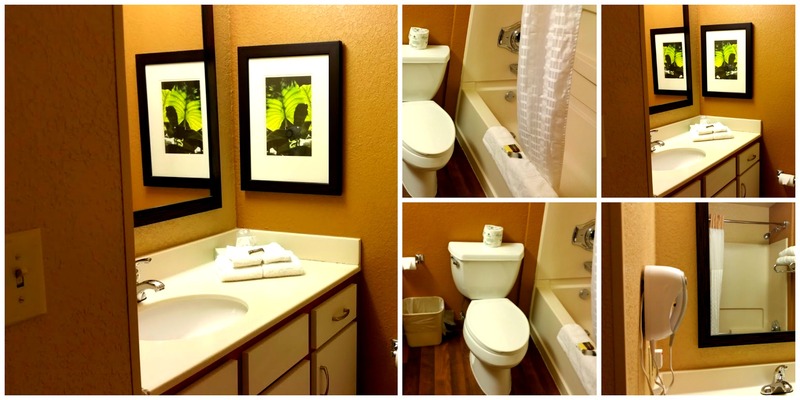 Extended Stay America is the perfect place to stay for frequent travelers. Providing an experience away from home, as well as a clean and friendly atmosphere. It also doesn’t hurt that they are budget friendly, as well as offering a very generous military discount. Thank you Extended Stay America. You provided a very restful stay during one of the most hectic business trips ever. Previous Previous post: What Are You Doing this Cancer Prevention Month?